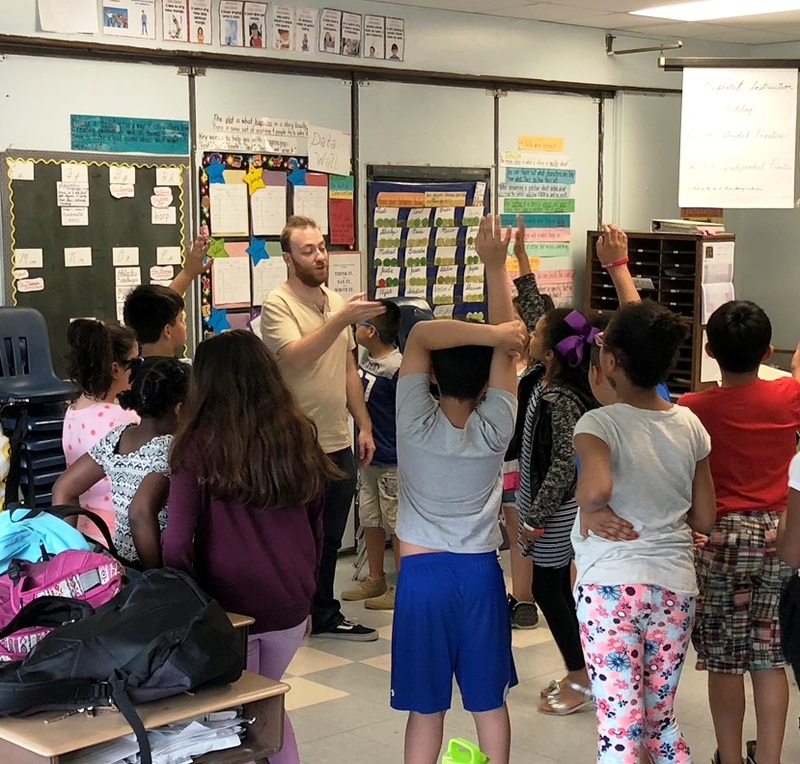 After a busy and fruitful school year, Arts Horizons plunged straight into our summer arts education programs in Brooklyn, Bronx, and Staten Island. 10 AH teaching artists conducted five to six week-long residencies at various sites administered by the following community-based organizations: Moshulu Montefiore Community Center (MMCC), Children of Promise, NYC (CPNYC), and United Activities Unlimited (UAU). We are pleased to recognize our longstanding partnerships with MMCC and UAU, and we are eager to continue deepening our new partnership with CPNYC. All three organizations have been doing exceptional work to provide spaces that foster educational, recreational, counseling, and/or social programs for children and young adults in New York City’s outer boroughs. After school and summer programming offered by these organizations are part of the Beacon and SONYC (School’s Out NYC) initiatives by the Department of Youth & Community Development (DYCD) in collaboration with the Administration for Child Services (ACS) and the Department of Homeless Services. At 7 MMCC Cornerstone sites, our teaching artists provided an eclectic offering of engaging programming to elementary and middle school children ranging from Afro-Caribbean Dance with Silvana Marquina to Percussion with Larry Washington, Jewelry-Making with Ken Fury, Jazz Vocal with Pamela Hamilton, and Visual Arts with Natalie Alleyne, Yako Prodis, and Mansa Mussa. AH teaching artist Ibrahima Camara had a very busy summer as he conducted African dance and drumming residencies for all three organizations! AH Program Coordinator Kiran Rajagopalan had the opportunity to visit two music residencies this summer – Grace Galu’s songwriting program for MMCC at Fort Independence Community Center in Bronx and D. Cross’s beatboxing program for CPNYC in Brooklyn. Let’s take a quick peek into their classes! Noted soul vocalist and vocal coach Grace Galu is a new teaching artist for Arts Horizons. Students in her songwriting classes learned all about using figurative language, counting syllables, and crafting narratives. She opened up her classes with a fun icebreaker, “Jump In, Jump Out,” in which students introduce and identify themselves to the class as a “singer/dancer/gamer/etc. for the rest of their lives!” Once they were energized, Grace asked them to name their favorite food or activity – the first class eventually chose ice cream and the second class chose dance. Together, students created short, poetic phrases with adjectives to describe how ice cream and dance made them feel, and these lines were compiled into a short stanza and chorus. Grace then brought out her guitar and sung her students’ songs acapella! Kiran’s second stop was at CPNYC in Brooklyn to attend a beatboxing class by longtime AH teaching artist and multidisciplinary artist D. Cross. CPNYC specializes in enrichment programing for children of incarcerated parents to “empower them to break the cycle of intergenerational involvement in the criminal justice system.” The focus of D. Cross’s residency was to introduce students to the basic elements of vocal percussion and music production through the creation of beats for songs. D. Cross assembled the students in a Hip-Hop cypher to facilitate improvisation and conversation through music. Students took turns beatboxing, improvising lyrics, or adding other sounds, and D. Cross layered their vocals into a cohesive beat with the help of a splicer machine! Arts Horizons was thrilled to see such active participation in the arts at MMCC, UAU, and CPNYC, and we are grateful to hear that our teaching artists’ efforts were well appreciated by students, faculty, and administrators. We would also like to thank Ms. Kim Viade, Ms. Monique Newton, and Ms. Gizzelle Lopez along with all of the site directors and staff for welcoming us into their programs. We are excited to continue our collaborative work with these amazing organizations for the next academic year. Our year-long after school programs at three ERSD schools were funded by the 21st Century Community Learning Center and Empire State After-School Program grants and administered by Wellcore. 6 AH teaching artists – Twinkle Burke, Scott Gaddy, Michael Gardiner, Yah’aya Kamate, Gail Lou, and Suzi Myers – conducted theater, African percussion, Hip Hop, and World Dance residencies for elementary and high school students. Arts Horizons Program Coordinator, Kiran Rajagopalan, recently visited American College Preparatory Academy and Elmwood Elementary School to observe Suzi Myers and Michael Gardiner in action. Let’s take a quick trip into their classes! Suzi surprised her dance students at Elmwood by showing up with dozens of strange bundles on sticks. She held up a bundle, which looked like cotton candy, and with a flick her wrist, out came a long, silk ribbon! Students were enthralled and very eager to learn Chinese Ribbon Dance. They were taught five fundamental movements from this ancient dance form: waterfall, river, rainbow, snake, and dragon. Afterwards, students freestyled movements based on “writing their names” or “drawing shapes” in the air. Michael Gardiner’s theater classes at American Prep focused primarily on interactive games which demanded utmost focus and developed critical listening and improvisation skills. Classes began with the “Zip, Zap, Zop” game. This theater exercise is designed to sharpen student’s listening skills by having each student call out either “zip,” “zap,” or “zop” in rapid fire succession. Michael then turned up the energy by having students moving around the classroom with a series of walking and jumping “in character” exercises. One class even ended their session with an improvised a skit set in an African Safari! Spring is finally in full bloom in New York, and Arts Horizons is preparing for the end of the school year and planning the launch of our summer programs. We are pleased to announce the fifth post of a series in which we spotlight two more of our partner schools in Manhattan that received an “Arts for English Language Learners and Students with Disabilities” (ELL+SWD) grant: PS 184M: Shuang Wen in Chinatown and PS 79M: Horan School in East Harlem. This is Arts Horizons’ fourth season participating in this initiative, and we have announced our 10 partner schools for this academic year in a previous post. Through this grant, participating schools “receive funding to create new or expand existing partnerships with arts and cultural organizations with experience serving English Language Learners (ELLs) and/or Students with Disabilities (SWD).” Our visual and performing arts programs for Literacy Development and Socio-emotional Growth effectively engaged these student populations through hands-on workshops that stimulated creativity, vocabulary development, speaking, and other communication skills. At PS 184M, three AH teaching artists – Pat Russell, Navida Stein, and Jeannine Otis – conducted residencies for grades 3, 4, and 7 in Circus Arts, Storytelling, and Musical Theater. 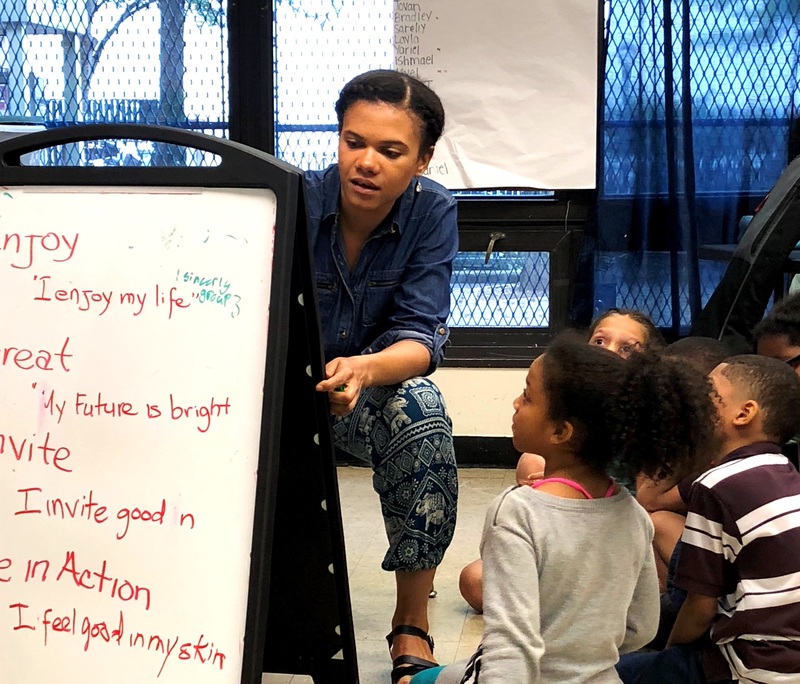 AH teaching artists Mansa Mussa and Natalie Alleyne have been part of an extensive visual arts program with District 75 elementary school students at PS 79M. Let’s take a quick visit to their classes! 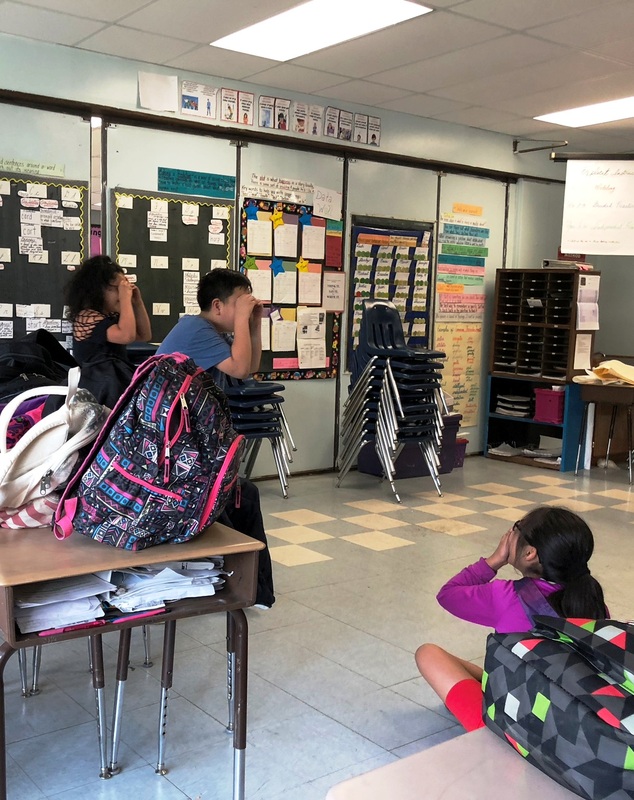 Earlier in April, AH program coordinator Kiran Rajagopalan attended (and videotaped) the final performances of Jeannine Otis’s 7th grade and Pat Russell’s 3rd Grade classes at PS 184M. Jeannine is an award-winning singer, songwriter, actress, and author, and she is co-director of Theatreworks USA’s production “Freedom Train.” Pat is a multidisciplinary theater artist and longtime teaching artist who specializes in clowning, circus skills, facepainting, and puppetry. Jeannine’s 7th grade classes presented “Message Songs,” an uplifting series of student-selected songs centered on the theme of social justice. A student representative from each of the three classes spoke briefly about their song choices and how they related to issues they have experienced at school and in their communities. “Man in the Mirror” by Michael Jackson, “Seasons of Love” from the musical Rent, and four songs from the megahit musical Hamilton were performed to a packed audience of students and parents. Jeannine even had a guest drummer, bassist, and spoken-word artist STARDA as part of the ensemble! PS 184M’s 7th Graders take the stage! Immediately following “Message Songs,” the auditorium was transformed into a circus with the assistance of several parent volunteers who hung up pennants, student artwork, and other paraphernalia. Pat’s 3rd grade classes then paraded into the auditorium and performed tricks, skits, and gags that wowed and amazed a second group of students and parents. Students juggled scarves, balanced feathers, played tug-of-war with an imaginary rope, tumbled on mats, performed magic illusions, and did tricks with hula hoops! The 45-minute show ended with an engaging Q&A in which students asked other students about all of the tricks they saw. It was a monumental undertaking to coordinate the logistics of these performances, and we thank visual arts teacher Ms. E-Anna Soong for all of her effort in their organization and execution. We also thank the principal Ms. Chiu and assistant principal Ms. Mee for welcoming us into their schools. Kiran then travelled uptown to visit noted mixed media artist Natalie Alleyne at PS 79M, and he observed her students creating collage portraits with such enthusiasm and concentration. Most students were instructed to create collage portraits using bits of construction paper and gluestick. Several students had already completed their collages in a previous class, and they learned how to use a tile cutter in preparation for next week’s lesson of transforming their collages into mosaics. The paraprofessionals and teachers were critical support to Natalie and her students, and we thank them for their assistance throughout the residency. For further information on applying for the Arts for ELL+SWD grant with Arts Horizons as a partner, please contact Dena Malarek at 201-567-1766 ext. 108 or dena@artshorizons.org. The deadline for new applications and renewals is Friday, June 8! With June quickly approaching, Arts Horizons has been very busy at work with preparations for the end of the school year. We are pleased to announce the fourth post of a series in which we spotlight two more of our partner schools in Queens that received an “Arts for English Language Learners and Students with Disabilities” (ELL+SWD) grant: JHS 226Q: Virgil I. Grissom in South Ozone Park and Q670: Robert F. Kennedy Community High School (RFKCHS) in Fresh Meadows. 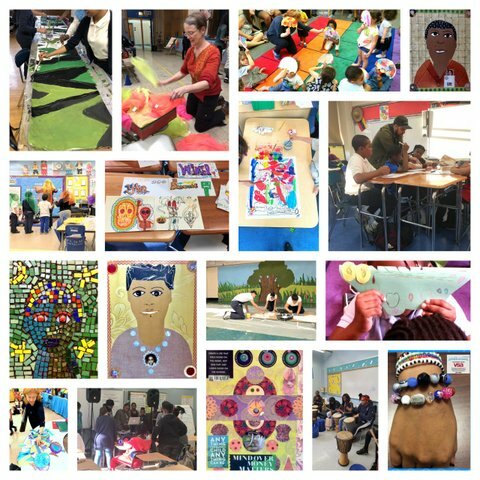 A complete list of all of our “Arts for ELL+SWD” partner schools can be found here. 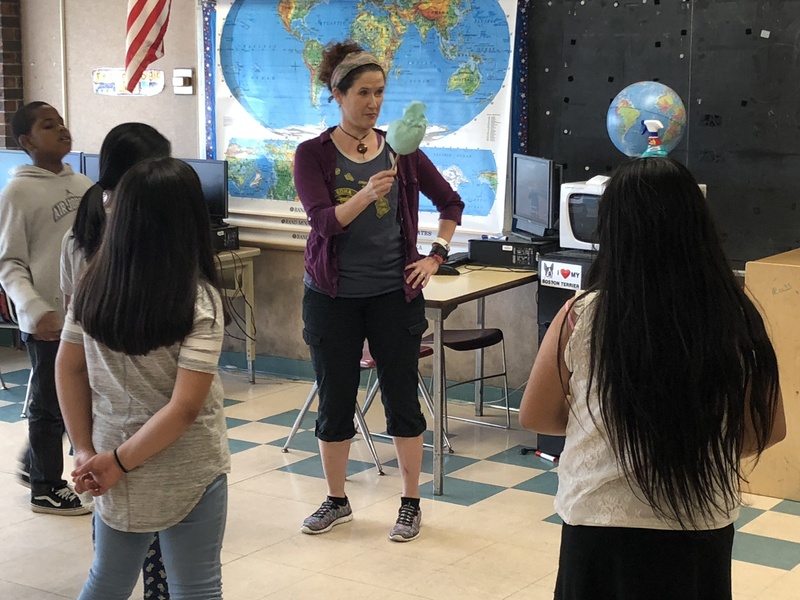 AH teaching artist Dawn Crandell recently concluded a successful playwriting residency with middle school students at 226Q while AH teaching artist Chris Lin is currently engaged in a year-long visual arts program with high school students at RFKCHS. Let’s take a quick visit into their classes! Chris Lin is a Queens-based visual artist with over 25 years of teaching experience with students of all ages, parents, and senior citizens. At RFKCHS, Chris is conducting arts integration workshops in English literature and traditional studio art classes to high school students. AH Program Coordinator Kiran Rajagopalan had an opportunity to observe Chris’s English class in which students are currently studying the hit Broadway musical West Side Story. This week, Chris is challenging the students to create evocative movie posters which graphically and symbolically depict the musical’s central themes through a variety of mediums such as collage, drawing, and sketching. We are excited to share an update on the expansion of the Arts Horizons LeRoy Neiman Center. For nearly a decade, our physical space of the Arts Horizons LeRoy Neiman Art Center in Harlem engaged the community in vibrant and innovative art classes and exhibits. After the recent closure of the physical site, we are remain committed to keep the concept of the center, and famed artist Mr. Neiman, alive through our work via the ‘LNAC Without Walls’ to continue offering quality programs which celebrate the rich history of the Harlem community. Our revered Family Art Programs will continue with a storytelling series featuring Miss Navida who will bring her talents to three New York Public Library branches. Children and their caregivers can take part in these programs at the Macombs Bridge Library, Countee Cullen Library, and Hamilton Grange Library. These programs are supported through the NYC Department of Cultural Affairs. Miss Navida is a specialist in storytelling, music and is a multifaceted actor, musician, educator, and playwright. Please see the schedule of programs below and contact the library directly for registration details. Children will create their own mini-umbrellas using a paper plate, glue, tissue paper & a popsicle stick. We will sing some rain songs & take a walk in the rain with our umbrellas. Everyone will help to tell the story of Mushrooms in the Rain. Children will create their own Turtle Puppets using a paper plate, glue, construction paper, a popsicle stick and crayons. We will learn the chanting/fingerplay poem There Was A Little Turtle and then use our turtles to tell the fun interactive story The Talkative Tortoise aka Why the Turtle’s Shell is Cracked or Eric Carle’s book The Foolish Tortoise. Everyone will take home their turtles and a copy of the poem. Children will create their own Crocodile Arm Puppets using crayons, glue & construction paper. We will learn the Miss Navida song When I Take a Walk with my Crocodile & take our newly made crocodiles for a walk. We will end with everyone helping to tell the story Crocodile Beat. Limited to a maximum of 20 participants. Children will create their own Fish Mobiles using colored pencils, heavy paper, glue, string & googly eyes. We will sing the song 5 Little Fishies, the Miss Navida song 1 Fish, 2 Fish & take our fish for a swim. For inspiration we will read the book Fish Eyes ending in a group storytelling experience of The 3 Little Fish & the Big Bad Shark. Limited to a maximum of 20 participants. Arts Horizons is pleased to announce the second post of a series in which we spotlight some our partner schools that received an “Arts for English Language Learners and Students with Disabilities” (ELL+SWD) grant. 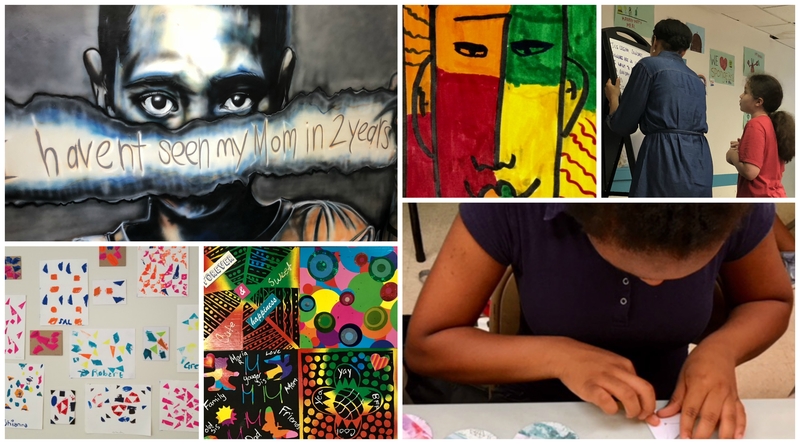 A list of all of our “Arts for ELL+SWD” partner schools can be found here. In the previous post, we visited AH teaching artist Judy Richardson’s engaging set design residency at CIS 303X, one of our newest partner schools. In this post, we highlight another new partner school – PS 28M: Wright Brothers School in West Harlem. Arts Horizons program coordinator Kiran Rajagopalan recently visited PS 28M to attend a session of longtime AH teaching artist Navida Stein’s storytelling residency. Miss Navida is a specialist in storytelling and a multifaceted actor, musician, educator, and playwright. Let’s take a quick peek into two of her classes at PS 28M! Miss Navida teaching a new song about a boat in English & Spanish to her students! Miss Navida’s highly energetic and engaging teaching style enabled students (and teachers!) to move swiftly between each activity. The 1st grade class began with students “singing their name” to the accompaniment of Miss Navida’s keyboard and the tinkling of jingle bells. Then they practiced statue friezes and movements for fish, iguanas, rabbits, snakes, and turtles in preparation for performing Mañana, Iguana by Ann Whitford Paul. Miss Navida even taught them a new song in English and Spanish about a boat. Her Kindergartners were so ecstatic when they got to perform a new song with scarves! 1st Grade Teacher Mrs. Perez, Assistant Principal Ms. Peña, and Principal Ms. Baez were all extremely appreciative of Miss Navida’s storytelling residency. Mrs. Perez, in particular, was especially impressed with how positively her students’ “behavior had changed in response to art.” We would like to thank all of the faculty and staff at PS 28M for their incredible support and for so warmly welcoming us into their programs. We hope this is the beginning of a long and fruitful partnership for years to come. Happy Holidays and check back with us in January for more spotlights on our other partner schools!